It was billed as the Topspiel of the matchday and Bremen v Frankfurt lived up to expectations. Both sides played free-flowing attacking football and in the end, had to share points as each side scored two goals. In the buildup, Werder Bremen were the team thought to struggle with Frankfurt’s pace. Ironically, it was the other way around. 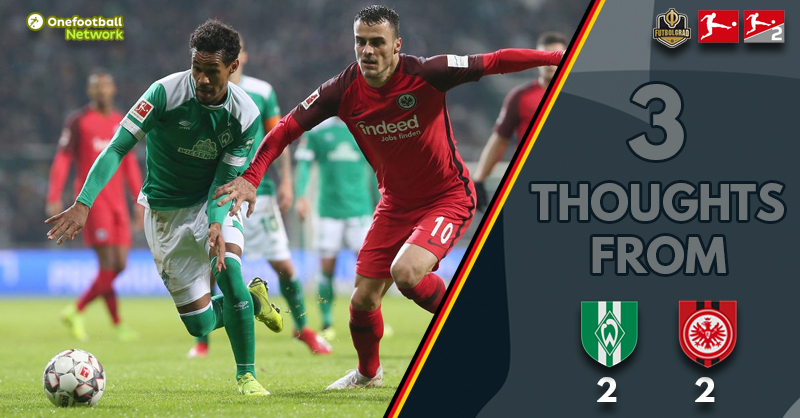 Frankfurt’s defence at times struggled as Werder Bremen were able to break forward quickly in countless situations. Frankfurt’s three-man defence was often picked apart and did not look like a cohesive unit. Instead, Werder’s forwards Johannes Eggestein, Max Kruse and Martin Harnik were able to challenge the backline in one-v-one situations and with no doubling were provided amble of goal-scoring situations. It was only thanks to keeper Kevin Trapp that Frankfurt did not go down until the 20′ minute when Maximilian Eggestein scored a fantastic goal to open the lead. Kruse should have then put the game away in the 33′ minute, but once again Trapp was excellent. Perhaps it was that Kruse chance that woke Eintracht Frankfurt up. In the 35′ minute Ante Rebić scored a wonder goal for the Eagles to make it 1-1. His dribble and switch from the right to the left foot to beat Werder keeper Jiri Pavlenka will without a doubt make the highlight reels at the end of the season. From then on it was a wide-open game in which both sides had plenty of chances. In the 52′ minute, Martin Harnik dribbled past the entire Frankfurt defence to make it 2-1 for Werder. Once again Frankfurt responded well. First Trapp made three excellent stops among others against Kruse in the 57′ minute. That stop may have been key as Frankfurt was awarded a penalty in the 67′ minute Werder’s Ludwig Augustinsson handled the ball in the box — Haller stepped up and scored the equaliser. Werder and Frankfurt where will the road take the two European challengers? Werder started the season with ambitions to challenge for a European qualification spot. The Werderaner, however, have dropped to 11th in the Bundesliga standings following matchday 18. But with 26 points they remain among a pack of teams that ranges from fourth to 11th spot that could ultimately land in the top four. Frankfurt are one step ahead of Werder in that regard. With 31 points Frankfurt are in fourth place — but could drop to fifth should RB Leipzig beat Fortuna Düsseldorf tomorrow. Either way, Eintracht could be among the teams challenging for a Champions League spot but in order to do just that cannot afford to play like they did in the first 20 minutes of this game. Furthermore, Frankfurt had chances towards the end of this game but being held by Werder highlights that the Eagles still need a perfect day to beat challengers like Werder. Up next for Frankfurt will be a home stint against Borussia Dortmund, who beat Hannover 96 5-1 earlier today.